What is Salatul Tasbih Namaz? What are the Benefits of Salat-Ul-Tasbih? Our Beloved Prophet Muhammad (Sallallaho Alihiwassallam) said to his uncle (father’s brother) Sayyiduna Abbass (may Allah be pleased with him) Oh uncle shall I not give you Shall I not grant you Shall I not award you Shall I not do mercy on you When you do 10 things Allah will forgive your sins: of the future and of the past; new and old; those you have forgotten and those you did knowingly; big and small; hidden and revealed. Learn here step by step method for performing Salatul Tasbih Salat: How to perform Salatul Tasbih? 1) In the first rakaat, after reading Sana "Subhaana Kallahumma...", read the above tasbih 15 times. 2) Now recite "Aoozubillah...", Bismillah "Bismillah...", Then read Surah Fatiha and a Surah or minimum of three small Ayayhs then read the tasbih 10 times again. 3) Go to ruku saying Takbeer (Allah Hoo Akbar), after reciting "Subhaana Rabbiyal Azeem" minimum of three times read the tasbih 10 times in Ruku. 4) Saying "Samee Allahu Liman Hamidah Rabbana Lakal Hamdh" get up from ruku to qiyam position. Now read the tasbih 10 times. 5) Go to Sajdah saying Takbeer (Allah Hoo Akbar) and after reciting "Subhaana Rabbiyal A'la" minimum of three times read the tasbih 10 times in Sajdah. 6) Now go after first Sajdah go to Jalsa (sitting position) saying Takbeer (Allah Hoo Akbar). Sitting in Jalsa read tasbih 10 times. 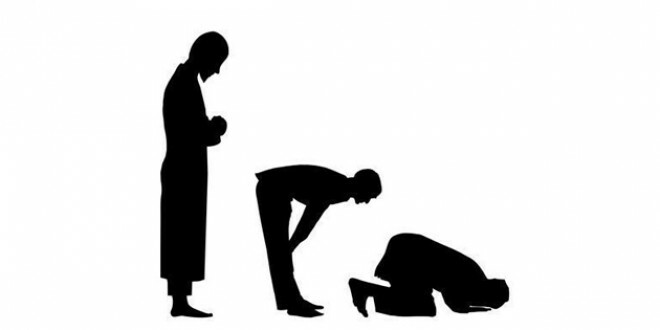 7) Go to sajda again saying Takbeer (Allah Hoo Akbar) and after reciting "Subhaana Rabbiyal A'la" minimum of three times read the tasbih 10 times in Sajdah again. 8) Do rakah #2 in same fashion, but before reading Bismillah "Bismillah...", and Surah Fatiha, read the tasbih 15 times. Follow the rest as you did in first Rakat. 9) After second Sajdah of Second Rakat sit in Qaidah Oola (first sitting) read Attahiyat, Durood and Dua then get up for 3rd rakaat without saying Salam. 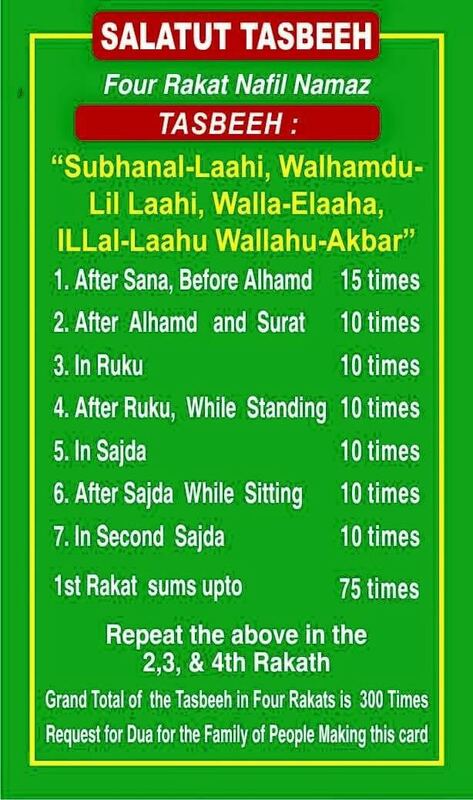 10) Begin third Rakat, just like the first Rakat, with Sana "Subhaana Kallahumma...", read the above tasbih 15 times. Follow the rest as you did in first Rakat untill you sit for Qaidah Akihra (last sitting) after second sajdah of fourth Rakah. 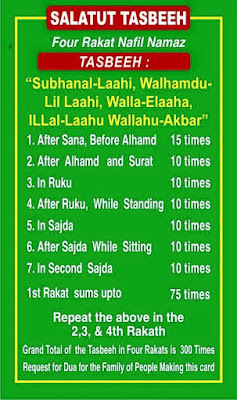 Steps to perform Salat-ut-Tasbih Namaz also called as "Salatul Tasbeeh", "Salatul Tasbih". What is Salatul Tasbih Namaz? How to perform Salatul Tasbih Namaz? 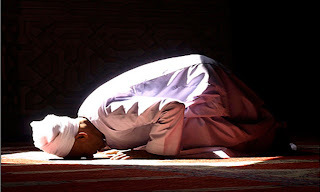 Learn here step by step method for performing Salatul Tasbih Salat. Watch Method to Perform Salatul Tasbih Salat. What are the Benefits of Salat-Ul-Tasbih?